The pillow made just for you. Order on Kickstarter and get $100 off today! So, why isn’t your pillow? There are a lot of decent pillows on the market today. Unfortunately, they just don't fit you. They were mass-produced at a factory… and you were not. 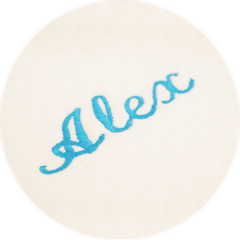 To get the healthiest and most comfortable sleep possible, you need a personalized pillow, individually manufactured to fit your exact dimensions. SlumbrSpace is a pillow that matches you. 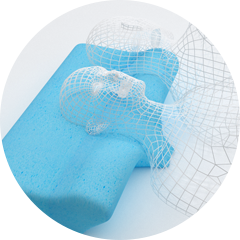 It is a one-of-a-kind pillow, designed and produced based on either your measurements or your 3D scan. 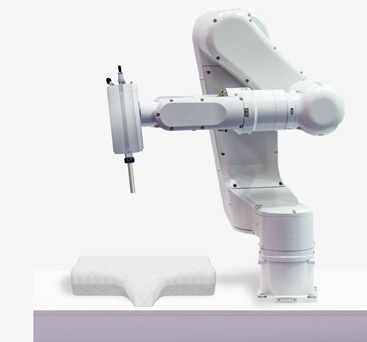 State-of-the-art technology allows us to manufacture a uniquely shaped pillow — your pillow. With a tape measure or 3D scanner, take your measurements. Using your measurements, we design your perfect pillow. A robot creates your custom, one-off pilow with the utmost precision. Your made-to-measure pillow arrives. Sweet dreams! Trouble sleeping? Waking up with neck pain, muscle stiffness, or headaches? Research data and clinical trials indicate that using the wrong pillow can negatively affect your health as a result of restless sleep, cervical and scapula pain, and overall poor sleep quality. Studies have shown that the use of an appropriate pillow is a significant factor in relieving neck pain, reducing or eliminating manifestations of sleep apnea and snoring, and improving the quality and efficiency of sleep. Using the right pillow can positively impact your overall health and help you fight back against restless, unhealthy sleep. 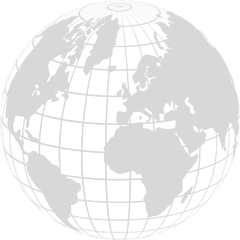 3D models of SlumbrSpace pillows are designed individually. A unique 3D shape, generated to your exact specifications, helps to maintain an anatomically-correct position of your upper spine and head during sleep. Take your measurements using a tape measure or, for an even closer fit, perform a 3D scan using a 3D scanner. When people choose a pillow, they generally only look at its height. The problem is that if a pillow has optimal height for back sleeping, it is far too low for side sleeping, and vice versa. To make things worse, research tells us that conventional pillows are bad for both positions because they are "too high for the supine position, and too low for lateral positions". Basically, we’ve all been sleeping on the wrong stuff for far too long. The shape of your pillow should accommodate different sleeping positions, and it should conform to your body. This includes the width of your shoulders, neck girth and length, and your head's diameter. 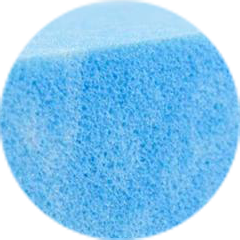 Produced with highly-accurate equipment, SlumbrSpace takes into account all of your body’s unique variables to create a truly individual pillow; one that takes proper care of you and your health while you sleep. Sleeping is a third of a lifetime. Make sure it is time well spent.